Dogs that work in country pursuits are bred for the jobs. If they come from good proven working stock, they are likely to be easier to train and succeed in their work. Even though they may be pedigree animals they are not typical show dogs. There are very few genuine working dogs that make good show dogs and vice versa. In general, they either look the part or play the part; rarely both! 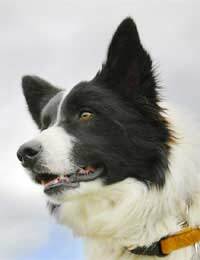 Border collies and shelties are sheepdogs synonymous with the word work. From the day they’re born these dogs are on a mission to round up the whole world. Then do it again. This kind of instinctive behaviour starts young. If pups are born in a working environment the lessons will start young too. Sheepdog trials and gundog field trials were developed to give a taste of what a day’s work in the field is like, but under competition conditions. There are different levels of trials, according to the experience of the dog and handler. For the trained, but relatively inexperienced sheepdog, nursery trials are usually the first ones to attempt. These events give dogs and trainers alike the chance to put their training into action, in unfamiliar surroundings and with fresh sheep. Useful tips can be picked up by watching more advanced working dogs and observing the different training techniques of others. They also provide the opportunity for enthusiasts to go along and see what it’s all about, or in some cases, not! Gundog field trials are split into groups of dog type: retrievers and Irish water spaniels; sporting spaniels other than Irish water spaniels; pointers and setters, and breeds that hunt, point and retrieve. The purpose of gun dogs is to assist people as they hunt game on organised shoots at specific times of year known as open season. When hunting pheasant and partridge, beaters drive the birds towards an area where the guns standwith their dogs. The spaniels, Labradors, retrievers, or other choice of dog, watch carefully to see where their birds land. When they are sent to collect the birds that have been shot they use their senses to find them and return them to the handlers without damaging them-that’s why gun dogs have soft mouth ‘folds’. For shooting in the early morning or late evening, when ducks are inflight over open water, the dogs may need to swim to find their bird, which is why some have webbed feet. To cover the amount of ground that sheepdogs work on a daily basis, they need to start early. There is nothing unusual about a dog covering sixty miles a day during the course of its various tasks, running from dawn to dusk, sometimes in extreme weather conditions and on some challengingterrain. ’Time Now’ and ‘Steady’ tell the dog to slow down, move steadily. There are different breeds of sheepdog in the UK. To cope with variations of terrain dogs need to be versatile as well as super fit. A good all-round dog is needed to cover steep hills and rugged moorland, carefully, while also having the capability to run for miles. Although they work every day, the busiest times of year are during lambing and shearing. The choice of feed is a personal decision but in order to cope with the physical demands of their work, both sheepdogs and gun dogs are fed a much higher protein diet than a couch potato pet. I am a student of Criminology and Security Studies in National Open University of Nigeria. I'm currently undergoing a project 'THE ROLE OF POLICE DOGS IN THE CURVING THE PROLIFERATION OF GUNS AND EXPLOSIVES IN NIGERIA'. I WILL BE VERY HAPPY IF YOU WILL PROVIDE ME WITH USEFUL INFORMATION ON MY PROJECT. Best Regards.